NEW ORLEANS – Four student-athletes who attained five individual national titles both indoors and outdoors in 2009 have added to their collection of hardware as the U.S. Track & Field and Cross Country Coaches Association announced Monday the Women’s 2009 Division II Indoor and Outdoor Track and Field Scholar Athletes of the Year. Those four athletes are Indoor Track Scholar Athlete Jessica Pixler (Seattle Pacific), Outdoor Track Scholar Athlete Ashley Puga (Northwest Nazarene), Outdoor Field Scholar Athlete Linda Rainwater (UC San Diego), and Indoor Field Scholar Athlete Jenna Schmidt (Central Missouri). Puga, a native of Meridian, Idaho, graduated with a bachelor’s degree from Northwest Nazarene with a 3.95 cumulative grade point average in business administration and finance. Puga was the 800 meter champion at the Division II Outdoor Track and Field Championships winning the event with a time of 2:07.24. She also competed in the 1500 meters at the national meet finishing eighth overall to earn her second USTFCCCA All-American honor. Puga was the 2009 USTFCCCA Outdoor National Track and Field Athlete of the Year in Division II and was earlier named the Great Northwest Athletic Conference Female Scholar Athlete of the Year. 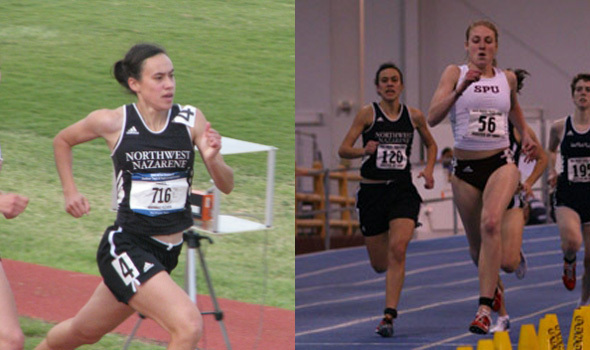 Puga ends her career at Northwest Nazarene as the most decorated student-athlete in school history. Rainwater, the 2009 Division II Outdoor Field Scholar Athlete of the Year, won the NCAA Division II title in the high jump clearing 5’9.75″ and was third in the heptathlon scoring 5,303 points. Both marks set new UC San Diego school records. At the California Collegiate Athletic Association Outdoor Championship meet she competed in five events, including the heptathlon, scoring 25 points to help lead the Tritons to the CCAA outdoor conference title. She won both the heptathlon and long jump at the conference meet. Rainwater, a Goleta, Calif. native, is a junior at UC San Diego studying Visual Arts and maintains a 3.74 grade point average. Seattle Pacific’s Jessica Pixler is this year’s Division II Indoor Track Scholar Athlete of the Year after winning two national titles in March at the Division II Indoor National Championships. The SPU standout and Sammamish, Wash. native won both the mile and 5,000 meter titles to help SPU to a sixth-place team finish. Pixler, a junior majoring in English, carries a 3.92 cumulative grade point average. She was named Seattle Pacific’s Athlete of the Year for the third straight time following her success this track and field season. Pixler now has eight national titles under her belt spanning the cross country, indoor and outdoor track and field seasons. Central Missouri’s Jenna Schmidt is the Division II Indoor Field Scholar Athlete of the Year for 2009. Schmidt, a sophomore from Sioux Falls, South Dakota, maintains a 3.84 cumulative grade point average in Sociology. She was the high jump national champion indoors clearing 5’9.75″ as Central Missouri finished third overall in the team standings. Schmidt also won the high jump title at the Mid-America Intercollegiate Athletics Association outdoor championships and finished fourth overall in the triple jump at the conference meet. In addition to the Scholar Athletes of the Year, the USTFCCCA also announced the women’s Division II All-Academic Track and Field Team. A total of 251 student-athletes representing 73 Division II colleges and universities made up the 2009 All-Academic team. For the second straight year Grand Valley State led the way with the most student-athletes on the list with 20, followed by Missouri Southern State with ten student-athletes on the list. Minnesota State University had nine student-athletes selected to the All-Academic team. The USTFCCCA honors Division II individuals for their academic and athletic achievements during the indoor and outdoor track and field season. To qualify for the USTFCCCA All-Academic Track and Field Team, the student-athlete must have compiled a cumulative grade point average of 3.25 and have met the NCAA Division II Indoor or Outdoor automatic or provisional qualifying standard in their respective event.